for the well-being of your cat. 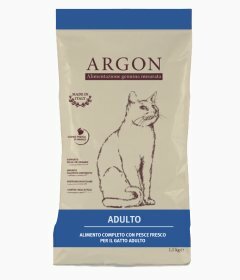 The products of Argon foods are free of dyes and added preservatives, designed to meet the nutritional needs of the cat at all stages of his life. Our every recipe was formulated using and dosing quality ingredients that make each food rich, complete and highly digestible. Because a healthy cat is first of all a happy cat. 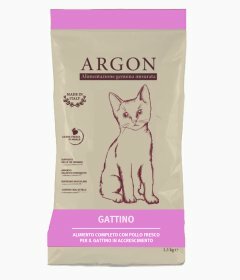 Argon Gattino is the recipe designed to meet the nutritional needs of the kitten in growth. The presence of fresh chicken brings to the daily diet high biological value protein, digestible and palatable, that will help to get the correct development of the Musculoskeletal structure. Biotin, zinc, omega 3 and omega 6, promote the development of a healthy skin and a soft, shiny coat. The Fructoligosaccarids regulate the intestinal flora for a proper assimilation of nutrients. The particular shape of the kibble has been studied to adapt to the needs of the kitten by promoting proper mastication. 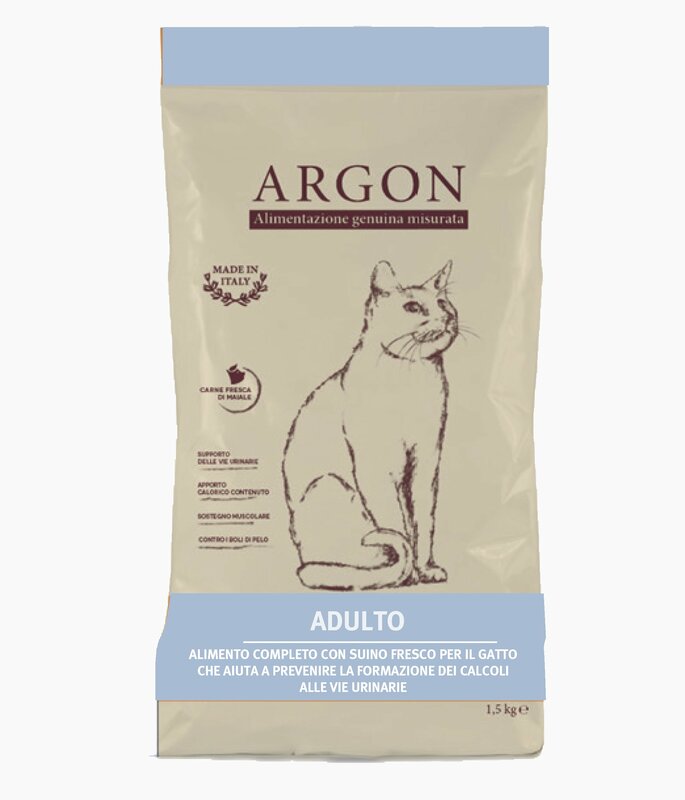 Argon Adulto is the recipe designed to meet the nutritional needs of cats. Adequate levels of magnesium, calcium and phosphorus, maintain the proper functioning of the urinary tract, helping to prevent the formation of urinary tract stones. The high percentage of fresh pork and the selection of raw materials of high quality make this food highly digestible. The L-carnitine helps to maintain optimal body weight and to reduce the accumulation of fat. Argon Adulto is the recipe designed to give to your cat all the nutrients they need for a correct and balanced supply. The high percentage of fresh fish and the selection of high-quality raw materials make this food highly digestible. The presence of selenium in organic form and vitamin E play a natural antioxidant action, helping to fight cellular aging. Biotin, zinc, omega 3 and omega 6, promote the development of a healthy skin and a soft, shiny coat. Argon Sterilizzato is the recipe designed for the nutritional needs of sterilized cat. The controlled calorie intake allows to maintain the ideal weight, avoiding the accumulation of excess fat. Adequate levels of magnesium, calcium and phosphorus, maintain the correct functioning of the urinary tract, helping to prevent the formation of urinary tract stones. The high percentage of fresh chicken and the selection of raw materials of high quality make this food highly digestible. The presence of selenium in organic form and vitamin E play a natural antioxidant action, helping to fight cellular aging. Biotin, zinc, omega 3 and omega 6, promote the development of a healthy skin and a soft, shiny coat. 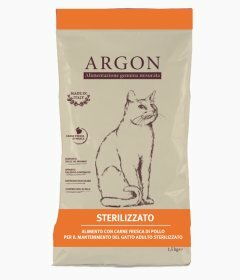 Argon Sterilizzato is the recipe designed for the nutritional needs of sterilized cat. The controlled calorie intake allows to maintain the ideal weight, avoiding the accumulation of excess fat. Adequate levels of magnesium, calcium and phosphorus, maintain the correct functioning of the urinary tract, helping to prevent the formation of urinary tract stones. The high percentage of fresh beef and the selection of raw materials of high quality make this food highly digestible. The presence of selenium in organic form and vitamin E play a natural antioxidant action, helping to fight cellular aging. Biotin, zinc, omega 3 and omega 6, promote the development of a healthy skin and a soft, shiny coat.